Uglyworld #227 - Caught In The Act, originally uploaded by www.bazpics.com. This morning we had to pack our bags and get ready for the drive back to Aachen (christmas parties tonight for both Mireille's job and mine). I had already loaded my own case and Wedgeheads into the car by the time Wedgie asked, "Where's my chocolate for the 5 hour drive? I left them here beside me on my seat!". This immediately got me thinking too, where the hell was Jeero. Myself and Wedgehead went back upstairs to the room to see if he was still there and as soon as we opened the door we could hear "nom nom nom" coming from the bathroom. I signalled to Wedgehead to be quiet which he acknowledged and then we crept quietly in armed with the camera. 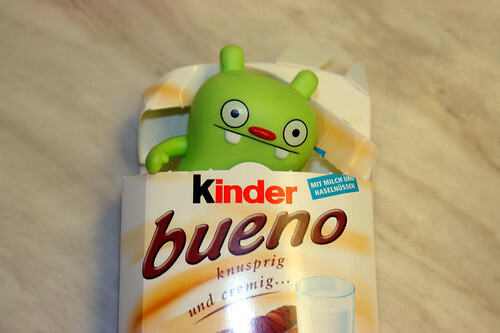 We immediately saw the Kinder Bueno box moving around on the floor, and then it suddenly stopping moving and out popped Jeero's head - funny as hell and definitely caught in the act!! !